Three families that I’ve done design work for put their houses on the market recently. All three of the houses sold within a week! I’m not afraid to say I believe the quick sales were not coincidences. I know a lot of things contributed, such as the neighborhoods, real estate agents and listing prices. But what I also know is that each family took the time and effort to collaborate with me on a design plan and invested in quality pieces of furniture that they will continue to use. I helped these families pull together their new homes by using pieces from their previous homes and adding or altering where needed. What has been really neat about it is that we used the same furniture and accessories, but in a new home the location of each piece was reworked. Chairs that were once used in a dining room got used in the living room of the new house. A settee that was once in the kitchen now got worked into a home office. With new paint colors and a new perspective on where everything is placed it all feels new without actually purchasing all new pieces. I am amazed sometimes by how little some people are willing to invest in their homes. Yet many people will pay hundreds or even thousands of dollars for designer handbags, shoes or clothing. I have absolutely nothing against expensive designer clothing, but I am of the opinion that most of your furniture should have a longer lifespan than most of your clothing. A well thought out and designed space will stand the test of time–just look at anything Dorothy Draper, David Hicks, Billy Baldwin (take your pick of A list designers) did 40 plus years ago. Their work serves as endless inspiration for designers because even after all these years it is still chic and looks current. In many cases their designs have remained untouched and still exist as originally created, in homes and hotels, today. Let your home be a reflection of your personal style and a place you are proud of. Let your home be a place to rest your mind and body after a long day of work or a place for your family to spend quality time together, or a place to entertain your friends and family. Don’t be afraid to invest in your home, even if you do it over time. I believe a comfortable and beautiful home can change your life… and will certainly help should you ever decide to sell! 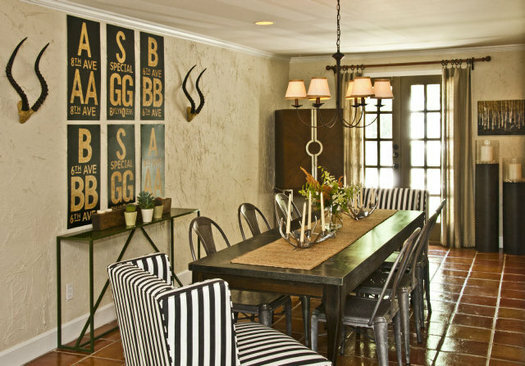 This homeowners previous dining room was much larger so we had space to use these great comfy black and white striped upholstered chairs on the ends. In their new home we easily moved these chairs into their living room since they no longer fit in the new dining room. Here is a shot of the chairs in the new living room. We are still waiting for a few pieces to come in to finish off this room–a new sofa and rug. I can’t wait to see it all put together though, it is going to be beautiful! The above article was written by Jaclyn Joslin for the KC Star Magazine. “But what I also know is that each family took the time and effort to collaborate with me on a design plan and invested in quality pieces of furniture that they will continue to use.” Well, time and effort do make a whole lot of difference in the outcome of a project. And good point! One should let his/her soul be part of whatever he/she is doing, so it will result into a beautiful creation.